Regular lawnmower maintenance is essential to ensure your lawnmower stays in top running condition. You should perform complete maintenance on your mower at least once per cutting season to maximize the mower’s life, and to ensure your grass is cut perfectly every time. check and/or replace a lawnmower spark plug. We’ll be performing maintenance on two mowers: a Murray with a 4.5 horsepower (HP) Briggs and Stratton engine, and a Craftsman self-propelled push mower with a 6.5 HP B&S engine. Note that this tutorial is for general information only and isn’t a replacement for the maintenance instructions included in the mower. You should always follow those instructions to maintain your mower properly. Finally, lawnmowers aren’t the only thing in your garage or shed that should be maintained this way. Any gas powered yard equipment, like pressure washers, chipper shredders, and string trimmers require regular maintenance to keep them running smooth. Most of the principals in this series will apply to all of these types of equipment. Changing the oil in any gas powered 4-cycle engine ensures the engine stays well lubricated. This keeps the cylinder and piston moving freely against once another, and ensures that scarring doesn’t occur on either, increasing the life of the engine. Changing the oil also offers more immediate benefits: it reduces overall gas consumption, and allows the engine to burn more efficiently, which is better for the environment. Step 1: Determine whether the engine has an oil drain plug, or if the oil must be drained by turning the mower over. Most push mowers have no drain plug and will need to be turned over to empty the oil. 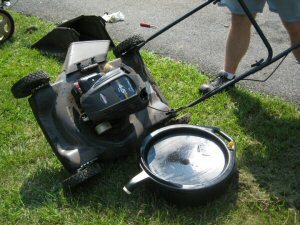 Step 2:If the mower has a drain plug, unscrew the plug and let the oil drain into a funnel down into a pan. If the mower has no drain plug, unscrew the oil cap, and tip the mower away from the side that the air filter is on. This reduces the chances of the air filter being drenched in oil, which can occur on some engines. Allow the oil to drain for 45-60 seconds, or until very little is flowing out of the mower. A typical oil change will drain about 3/4 of the oil in the mower. The remaining 1/4 will remain inside the engine, clinging to internal parts. Step 3: Identify the right oil for your engine. In some cases, the engine will have the oil type listed on a tag on the engine. The maintenance manual will always include the right type of oil to use. Many 4-cycle, small Briggs and Stratton engines take SAE 30 4-cycle Small Engine Oil available at home improvement and auto supplies stores everywhere. Step 4: FIll the oil resevoir with oil. Be sure to fill only until the dipstick registers “full.” If you overfill, the lawnmower will billow white smoke as the excess oil is burned off during combustion. An engine that is slightly overfilled will exhibit this behavior going up and down hills. Note in the picture below that the top of the Craftsman dipstick indicates a 20oz. capacity; however, this is an “empty” capacity, not a “change capacity.” In this case, we started by adding 10oz., then checking the dipstick every 2-3 oz. until it registered full. Step 5: Perform the remainder of your maintenance, or start the mower if you are done with maintenance. The mower should be running smooth (or at least smoother than it was running). If the mower isn’t running smooth, check these steps and ensure you’ve done everything correctly. Changing the oil a second time likely won’t solve the problem unless you’ve made a mistake. You’ll notice if you check the oil again that it has turned brown. This is because the new oil and old oil have mixed together. This is OK and is not indicative of a bad change. What do you think? How often do you change your lawnmower’s oil? Are you due for a change and putting it off? If it has a drain plug it is a square headed plug or cap. A cap is female, plug is male. BOTTOM of engine. FINGER tip size. Where is the drain plug on a Craftsman 550 series mower? I think it’s under the deck. If I tilt the mower to take out the plug should I drain the gas first? the drain plug on a B&S is under the deck and takes a 1/4″ ratchet to remove it. I changed the oil in mine today. I seem to have trouble starting my briggs and stratton lawn mower,the oil leaks from the exhaust,what could i have done wrong and how can i rectify this? Reinhardt, sounds like you might have overfilled the oil. Is the exhaust smoky? The exhaust is always smokey..
where do you put the oil in a briggs 4.5 push mower ? i just bought a used one and it may be missing the stick ? That’s one helluva accent you got there Sir. I can hear it through your keyboard. I had to comment on that. Thanks for the tip! I just purchased a 5.0 hp 20″ Briggs & Stratton Push Lawn Mower . Do I mix the oil and gas together. Do NOT mix oil and gas for your lawn mower! It will be a disaster. I filled mine with what I thought was plain gas, but my husband had mixed oil with it for the weedeater. The lawn mower billowed out white smoke and stunk up the whole neighborhood. He lables the gas cans now! I need to change the engine oil to my Craftsman Briggs & Stratton 6.25 Hp front gear drive. The machine have the drain plung underneath but there is a plastic cover for the belt that blocks the drain plug. I pull out the blade but I can’t get off the plastic cover. How I suppose to change the oil? Thanks in advance for your help. 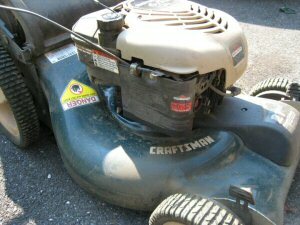 I have a used Craftsman 6.75 HP mower I bought from a friend. Needless to say, no maual. I”m not sure what kind of oil I can use in it (if regular mower oil isn’t available). He says regular automobile oil. I don’t trust his judgement. you change oil on a 4.6 & 6.5 is it done the same way on a 5.50 Silver Edition Brigg &Straton 21 inch cut ? I have a Craftsman 6.5, self propelled lawnmower. Either side discharge or rear baging. Without seeing your particular lawnmower, I can’t be sure. Odds are that it has no drain plug and that you’ll need to turn it over in order to empty the oil. By turning the mower over( and how far over) will this screw up the bowl float needle ? I have a b&s 6.75 ohv pressure washer.It has no dipstick,so is the proper oil level up to where it runs out of the oil plug hole or just up to the bottom of the threads?Thank you. Roger, sorry, that’s one we can’t help you with. Hi Jessie, I’ve never worked on a Poulan Pro. Did it come with a manual? If not, you can download one here: http://www.poulanpro.com/node7975.aspx. The manual will indicated what type of oil and how much. Additionally, the mower probably has a dipstick with a “Full” line that helps you determine when to add oil. Hope this helps. I cannot find my booklet on it! I have a Craftsman push mower (circa 2003) with a 6.5 hp B&S engine. My question is regarding the setting the correct position of the dipstick when checking the oil level. Which position (1 or 2) of the dipstick is the correct position to accurately check the level of the oil? Keppie, REALLY tough question and it shouldn’t be. I can tell you that I usually do lock the dipstick in place, then unlock it and use that reading. You’re talking about 1/8 of an inch usually, so I don’t know that it’s that dramatic of an effect. I’ve never had a problem using this method. What type of oil do I put in a Murray 22 lawnmower with a Briggs and Stratton engine? Your best shot for an answer this specific is to check B&S’s web site or give their tech line a call. Take care. Don’t forget that depending on the engine it might be best to run out the gas first too to keep it from leaking. my son turned the lawnmower over to empty some of the grass that was underneath ever since the mower has been smoking and putting like we have bad gas please help it a brand new mower not sure what he could of done but as he cutes the grass it sparks and blows out smoke!!!!!!!! Probably got oil into the air filter. Change the air filter first, let it sit for a while, and then restart after a few hours. If there’s too much oil (overfilled), you will need to drain out the oil to fix it. doesn’t a briggs and stratton motor for lawn mowers( push ) have some sort of oil filtering unit on them to look at when doingn oil change? Mike, no, the smaller engines do not have a filter. Probably takes traditional 4 cycle oil. You can find stuff formulated for lawn mowers at Sears, and they should also be able to answer your question on this engine. I have a Craftsman 190CC 22″ that started blowing smoke, sputtering, and finally dying, so I knew that I had overfilled the oil. I drained it and replaced with what seems to be the right amount of oil. It started once after that but I let it stop (to take care of the oil pan) but when I returned it wouldn’t start at all. I’ve tried for the last 20 minutes to start it with no luck. Any ideas? Do I need to let it sit for a while? Let it sit. If it still doesn’t work, check the spark plug and air filter. I changed the spark plug and it fired right up. Thanks a bunch. I have a b&s 625 went to cut grass, it started popping and suddenly died. Thought I had water in the gas, changed it and checked carburetor still doesnt start. Can u help? I WOULD LIKE TO ADD THE CORRECT # OF OUNCES TO BRING THE DIP UP TO “FILL”. WHAT I THINK I ‘F BEEN READING I SHOULD ADD 20 OZ.